The venerable cycling computer provides all of the data that most casual cyclists need for their ride. How fast am I going? How far have I ridden? How long did it take? A device for your bike that tells you all of this information and more can be had for as little as $30. Most also give you information such as average speed and a time-of-day clock. For a few dollars more, you can get more advanced features like a wireless connection between the computer module and the wheel speed sensor, multiple bike calibration, temperature, altitude, and calories burned. 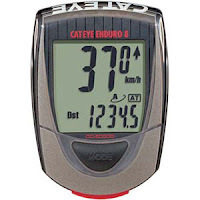 The calorie counter uses a calculation based mainly on the rider's weight and the distance traveled, so it is a rough estimate that must be taken with a grain of salt. Some of the newest earth-friendly models also tell you how much CO2 you saved from going into the air by cycling instead of driving. Some cyclists like to be aware of their cadence, which refers to the rate of rotation of your pedaling, measured in revolutions per minute (RPM). Athletes following a serious training regimen also like to track the power that they generate during a bike ride, which is measured in watts. Some advanced cycling computers can be paired with sensors located in the rear hub, crank arms, or pedals that measure wattage. These specialized components can be a several hundred dollar addition to your bike, but provide the most accurate measurement of power. Cyclocomputers are powered by one or two coin-type batteries, which typically need to be replaced about once a year. They are reasonably weatherproof--you are not likely to have any issues even if caught in heavy rain during a long ride. PROS: Small size, lightweight, reliable operation, long battery life. CONS: No advanced ride-mapping capabilities. With the popularity of Global Positioning Systems (GPS) in automobiles, it was not long before this technology trickled down to the world of bicycling. The devices use the network of satellites in orbit around the earth to determine your postion. By measuring and tracking changes in your position, the GPS unit is able to calculate the same information as a traditional cyclocomputer--speed, distance, time, average speed, etc. Some GPS models also provide a calorie counter; like cyclocomputers, it's a rough estimate, but since it can also take changes in speed and elevation into account, it can be somewhat more accurate. 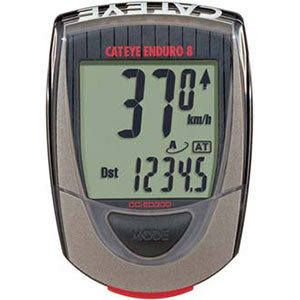 Since the GPS device does not require any sensors mounted on the bike to track you speed and distance, no bike-specific calibration is required for installation. This makes it easy to move your GPS from one bike to another; you can purchase additional mounting brackets to make it a one-step, one-click process. The device is typically enclosed in a sealed waterproof case, so you won't have any issues out in the rain. 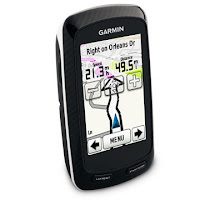 The big advantage to GPS computers is that your ride data can be integrated with real map information. After your ride, the data can be uploaded to either your personal computer or an online service, which then shows you your route on a live map, where you can zoom in on specific features, like streets, roads, and hills. The software saves all of your past rides, so you can compare your performance over time on the same route. You can even compare your rides with others, compete against your friends, and share your routes on social media sites. Once you have saved routes in your GPS software, these routes can be loaded onto your GPS device before you head out on a ride, and the device can give you turn-by-turn directions for following the route. 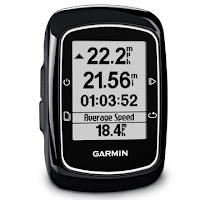 Even the least expensive bike GPS model from Garmin (the Edge 200 for $149.99, pictured at left) has this capability. More advanced models, such as the Garmin Edge 800 ($449.99, below right) have a full-color display just like car GPS models, so you can see a live map right in front of you to help you find your way during a ride. GPS units require that ability to maintain communications with the satellites. This works well in remote areas, but can be an issue if you're riding off-road in wooded areas with heavy tree cover. The map data is stored within the device itself, so you may have to purchase periodic map updates to have the latest street and road information. Most GPS units have a rechargeable lithium-ion battery (just like most modern mobile phones) that provides from 12 to 18 hours of use between charges, so you're good to go for a couple of rides before you have to recharge. This may not work well for you, though, if you are doing long-distance touring and don't have access to electricity for several days on end. The fitness electronics industry has devised a standard that allows GPS and similar devices to communicate with optional hardware. This standard is known as ANT+. You can purchase ANT+ devices to extend the features of your GPS, such as speed/cadence sensors, power sensors, and heart rate monitors. PROS: Live route tracking and route following, elevation tracking, easy multi-bike setup, good battery life for day riding. CONS: Battery life not suitable for long-distance touring, map data updates usually must be purchased. The advanced models of modern cellular telephones, such as iPhones and Android phones, have a GPS device built into them. This is usually used by the phone's map application to help you find local businesses near your location, but it can also be used to track your route while riding just like a dedicated GPS device. 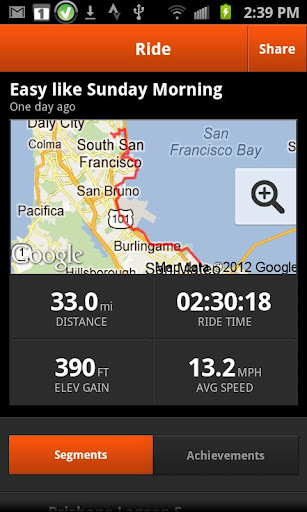 You can download apps for your phone from several different popular services, such as Strava, Endomondo, and MapMyRide. These apps are usually free to use the basic features, and provide a paid option to unlock more advanced features. Which features are free and which are included only in the paid version will vary from one company to another. These apps and their companion web sites provide the same kind of features that you get with a dedicated GPS unit. You can keep track of your ride, upload it when you done, view it on a map, compare it to past rides, and share and compete with your friends. When you want to track a ride using your smartphone, you can activate the app at the beginning of the ride, and just keep the phone in a bike bag during the ride. Or, you can purchase a handlebar-mounted phone holder so you can use the phone's display to get a live view of your speed, distance, and current location. If you ride in all weather conditions, you'll want to invest in a high-quality waterproof case to protect your investment. Bluetooth is a standard used by cell phones to connect to wireless headsets and other devices, and most of the GPS apps for smartphones are Bluetooth-compatible, which means you can purchase a Bluetooth-enable heart rate strap to add heart rate monitoring capability to your smartphone! There are bike cases available from Wahoo Fitness that add ANT+ connectivity to your smartphone as well, so you can take advantage of the full range of ANT+ fitness devices available (speed/cadence sensors, power sensors, and heart rate monitors). There are also smartphone cases available that add power measurement by taking additional factors, such as wind speed, into account. The smartphone GPS apps get their map data live over the Internet, usually from Google Maps. This means that the road and street information is always up-to-date automatically, without any need to buy or install map updates. However, you must be in a coverage area for your cellular data plan in order for the app to work, and the usage counts against whatever limits you may have in your data plan. It sounds like if you already own a smartphone, there is no reason to buy any other electronic device to use on your bike. However, the one big drawback to smartphone GPS apps is that they are a large drain on your phone's battery life. If you're doing an epic day-long ride (possibly even shorter), and you bonk or have a mechanical breakdown out in the middle of nowhere, you might be left with no juice in your phone just when you need it the most! A smartphone will likely take up more space on your handlebar compared to a dedicated bike computer or GPS. 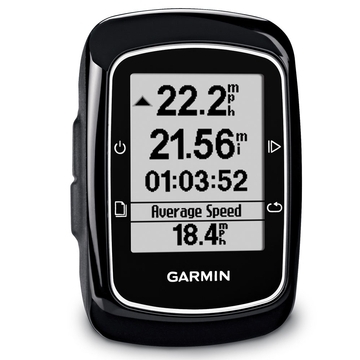 PROS: Live and current map data, full-featured phone, GPS, and bike computer in one device. CONS: Poor battery life, will not work in areas with no cellular data service. I'm sure there are a wide variety of experiences, good and bad, among people using smartphone GPS apps. I'm sure the accuracy varies greatly with the weather, the app, the phone model, the quality of cellular data signal, etc. I've had pretty good luck using Strava on my Motorola Android-based phone. At the end of the ride, it usually registers to within a couple tenths of a mile to what's showing on my cyclocomputer.